Cercis canadensis or Eastern redbud is an understory tree native to eastern North America. The small tree has two showy characteristics. It has "fluttering" heart-shaped leaves. The long stems (or pedicels) on which the leaves grow allow them to "flutter quite freely in even the smallest breeze". The other dramatic feature of the Eastern redbud is the flower. 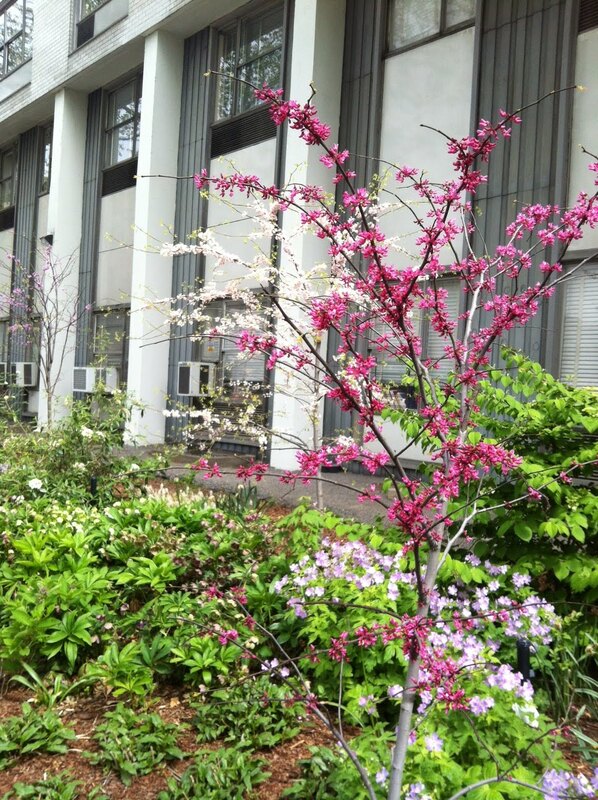 The redbud is one of the first trees to flower in the spring. The flowers emerge before the leaves and almost cling to the branches and stems of the tree. In some cases, the flowers emerge from the trunk itself! The photograph above shows three redbuds in bloom and each with a different colored flower (foreground to background): maroon, white, and lavender. The flowers are edible, as are the seeds. Top your dessert with the flowers. Pickle the buds. The flowers, leaves, and seeds have wildlife value, too. Birds eat the seeds, deer the leaves, and honeybees the nectar. Here are looks at the seedpods and the leaves. Have you eaten any part of the redbud?